"Check your city and state for breed-specific laws and limits on the number of animals per home," advises Amy Ference, a Realtor® in Bozeman, MT, and owner of two pit bull mixes. "For example, Bozeman requires a kennel license if you have more than two dogs." * Some HOAs or condo developments restrict the number or type of pets you can have, or spell out how your pet must be restrained in common areas. * In condo developments, there is often a limit on the number of dogs allowed per unit, or even per floor. "It’s important not to assume dogs are allowed because you saw one during your tour," explains Ference. "Sometimes they are only allowed on the first floor, or in end units." * If you have a breed that tends to bark a lot (ruh-roh), find out if your HOA or city enforces any noise ordinances. "I’ve seen covenants that only allow underground electric fencing, restrictions on the size or materials allowed for outdoor kennels or dog runs, and most neighborhood covenants outlaw animals running at large, so if you’re looking for a country setting where Fido can run free, it pays to give those a careful read," says Ference. "You want to find a place where you’re happy to walk," says Ference. "In snowy climates, that also means places with sidewalks, or you’re stuck walking in the roadway—which is super dangerous—or trudging through snow, which is exhausting." Pet-friendly flooring is a big issue. Flooring expert Debbie Gartnerrecommends solid hardwood since it can be refinished when it's scratched, and suggests looking for very light or very dark wood, and triple-sealing it with high-grade polyurethane (use a water-based poly for light floors, and oil-based for dark). If you're putting in new flooring anyway, consider reclaimed or distressed wood so that the scratches just add more character. Other good flooring options include poured concrete, tile, luxury vinyl, or laminate. So what's not so great? Wall-to-wall carpet. "Carpeting is not great for resale value," says Ference. Cats will claw it, dogs track in mud and dirt. Carpet also traps smells from accidents, stains easily, and collects pet hair. 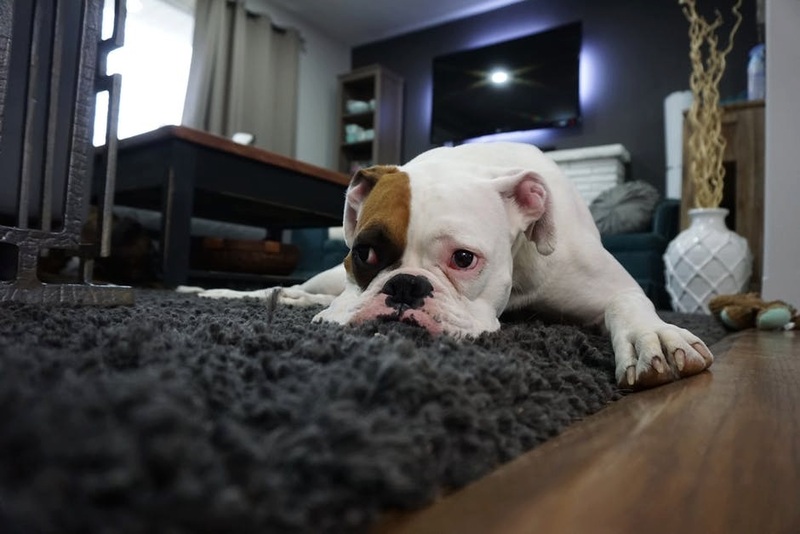 If your dog or cat (or hey, human family members) needs something softer underfoot, go with an area or throw rug, which can be cleaned or replaced. "You’ll be pretty sick of your house in short order if you’re always tripping over the dog—trust me on this one," Ference says. Is the space big enough for your dog's breed? Is there enough room for a cozy dog bed or cat tree? If you're downsizing, you should take into account how a tighter space will stress your pet. "When dogs get older, they can get joint problems that make it difficult for them to do steps," explains Gartner. Just like their owners! If you do choose a multilevel home, look for a place that has a carpet runner on the stairs, or be ready to install one. "It's the No. 1 request for people with dogs," says Gartner.